When Jeremy was placing an order with Chocosphere a few weeks ago, I asked him to order me half a pound of milk chocolate for baking. He obliged with Guittard milk chocolate chips, but accidentally ordered two 2.2lb bags. We typically prefer dark chocolate any day of the week, but here I was with nearly four and a half pounds of milk chocolate to use up. We figured a good place to start would be with chocolate chip cookies, natch. As I was reaching for my gold standard cookie recipe to get started, I remembered my still-pristine copy of Baking: From My Home to Yours by Dorie Greenspan, and decided it was way overdue to be broken in. I went for a straight comparison and made her chocolate chip cookies. My butter sat on the counter while I made dinner, so it was very soft when I was ready to start dessert. The batter consequently whipped up to incredibly fluffy proportions, even with the addition of chocolate chips and nuts. For the sake of full disclosure, I ended up using just over half whole wheat pastry flour because I ran out of all-purpose, no surprise in my currently barren kitchen. 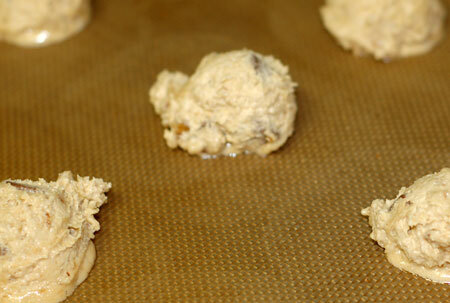 I used a little cookie scoop to drop rounds onto a silpat-lined cookie sheet, and in they went. Ten minutes later, they came out flat as crepes and much browner, but the dough was so pale I hardly think I can blame the whole wheat flour. I think it was all that sugar and butter caramelizing, because that’s what the cookies tasted like. The cookies were so flat that the chocolate chips in them look like boulders, and mostly stayed right in the center of the cookies, interestingly. They tasted very good, and had a good crisp-chewy textural balance, but they tasted of butter in the extreme, so much so that I was constantly aware of how naughty they were to eat. Thank goodness for running out of AP flour, or I would feel altogether too guilty to eat more than a few of these. 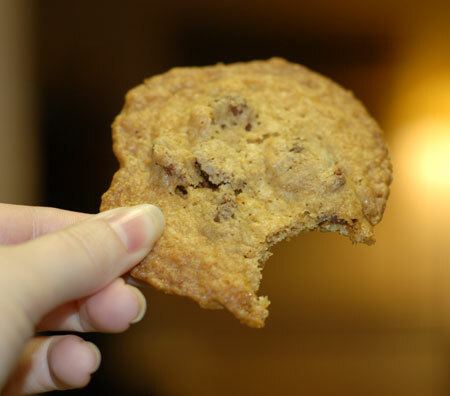 On the whole, I prefer my chocolate chip cookies thicker and slightly undercooked in the center, not to mention less obviously guilt-inducing. Even my favorite recipe doesn’t quite do it for me in that category, but it comes much closer. They didn’t seem quite so decadently buttery after they had a chance to cool, and we had no problems taking care of this batch of cookies. 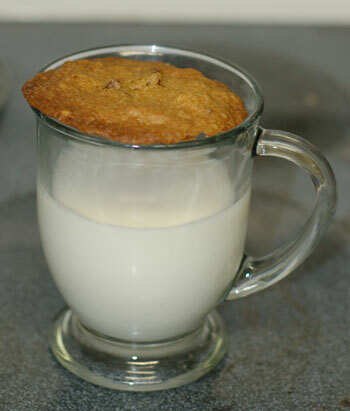 Still, I think our next batch of chocolate chip cookies will mark a return to the tried and true.